The above route will involve about 2,100 miles of driving (not counting day trips and sightseeing detours) and 44 hours on the road (counting time spent on ferries), so my new RAV4 hybrid will be getting quite a workout! Day 1: Driving up to southern Maine and crashing overnight at my sister-in-law’s house. We will be staying in a cottage overlooking the Bay of Fundy, first stopping in the seaside town of Saint Andrews for linner (i.e., in between lunch/dinner). 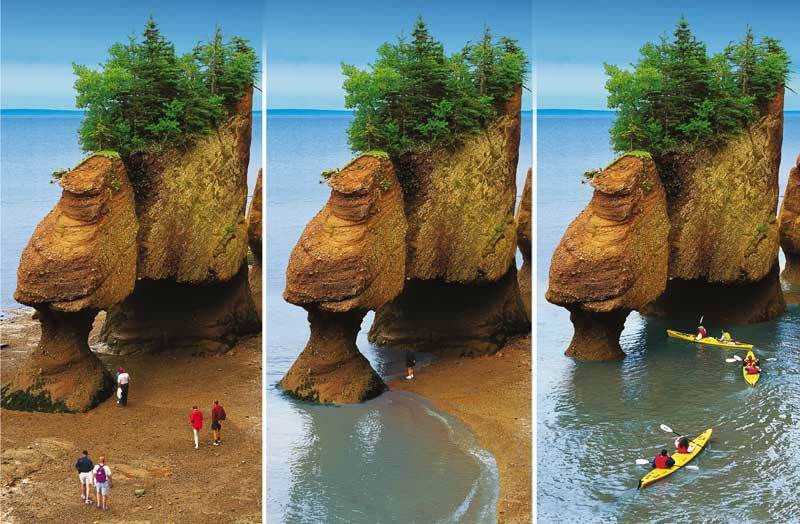 During our stay the plan is to visit the Hopewell Rocks at both low and high tide (the Bay of Fundy has the highest tidal range in the world), Cape Enrage, and Fundy National Park, as well as the Fundy Trail and sea caves in Saint Martins. A visit to Saint John is also a possibility, though not as high on the list. This will be our home in PEI. Our next stop will be Prince Edward Island, famous for its rolling hills, red soil, and as the setting of the novel Anne of Green Gables. We don’t have any specific plans for our two days here; I figure it’s a good time to recharge after all of the driving and activities of the first three days, so we may just relax on the beaches and take some lazy drives around the coast. We will be staying at a B&B on the northeastern coast, an area that is supposed to be less touristy. This will mostly be a travel day as we hop on the ferry from Prince Edward Island to Nova Scotia and then make our way up to Cape Breton. Along the way we may stop in New Glasgow for lunch before crossing into Cape Breton and taking the scenic Ceilidh Trail along the coast all the way up to our stop for the night near the highlands: The Glenora Inn and Distillery, known for its whisky, where we’ll have dinner before settling in for the night in a private chalet nestled in the hills above the distillery. This is the main attraction of the trip for us, a chance to meander through a landscape similar to what you might see in Scotland. We’ll begin on Day 7 with a drive along the Cabot Trail, famous for its picturesque beauty. Along the way we will stop and hike the Skyline Trail before continuing on to our destination for the next three nights: a private cabin overlooking the ocean near Ingonish. On Day 8 we will do more hiking in Cape Breton Highlands National Park, highlighted by an ascent of Franey Mountain. Finally, Day 9 will see us heading up to the Meat Cove area at the northernmost tip of the island for a whale watching cruise on a converted fishing boat. On Day 10 we will begin the long drive from Cape Breton all the way to Halifax in Nova Scotia, where we will be staying in a B&B not far from the waterfront. The first night will likely be a late arrival, so we’ll probably just walk along the boardwalk and get something to eat. On the second day, we can wander around the city (possibly visiting the Citadel at the top of the hill) or, if we’re feeling up to it, take a 90-minute drive north to hike out to Cape Split, a hike that comes highly recommended due to the spectacular view at the end of the trail. After leaving Halifax we will embark on a daylong drive to Yarmouth while following as much of the scenic coastal Lighthouse Trail as possible (we won’t have time to do the entire route), taking us through towns like Peggy’s Cove, Mahone Bay, and Lunenberg, the latter of which might be a good place to stop for lunch. Other possible stops include The Ovens (to do some sea cave spelunking) and the Kejimkujik National Park Seaside Adjunct. Our late arrival in Yarmouth will leave us one free day to explore the town (and scratch the wife’s antiquing itch). We’ll be waking up early in the morning in Yarmouth to catch the ferry to Portland, Maine for what is supposed to be a 5.5-hour journey across the Atlantic. The ferry is not cheap–in fact I believe it may have been the most expensive single booking of our entire trip, more so than any of the lodging. Anyway, after departing the ferry we will once again crash at my sister-in-law’s house in southern coastal Maine before beginning the final leg of our journey back home to New Jersey. I can’t wait to get underway; I’ve always wanted to do a big road trip, and a two-week jaunt through the Maritimes should be epic, though we’ll still only scratch the surface of everything the region has to offer. The rest, alas, will have to wait until next time. Thanks, I’m so looking forward to it!